The Cedar Rapids Kernels sported a 9-7 record as they departed for Peoria Monday for the first of seven road games before returning to Veterans Memorial Stadium on Monday, April 28. They enter the week just two games behind Kane County in the Midwest League's Western Division standings. One reason for the success they’ve had thus far has been a power surge in the heart of their batting order. The Kernels lead the MWL in slugging percentage entering this week's games, largely due to power generated by catcher Mitch Garver and infielder Bryan Haar. Garver leads the league with five home runs, and Haar is right on his heels with four round-trippers. This past weekend, Haar shared his perspectives on the start to the season that he and his teammates have had, as well as some thoughts about his own experiences moving from college ball, through two levels of Rookie level professional baseball and on to his first month with the Class A Kernels. Though Garver and Haar have provided much of the power for Cedar Rapids, Haar insists their offensive success has been a team effort. "When our team got hot and went on a little winning streak, I think we were all hitting pretty well so that helps," said Haar. "Hitting is contagious. So I think we all contributed to the good start." While the Kernels have kept their record above .500, they haven't exactly had it easy thus far. Haar and many of his teammates have spent their lives playing ball in far warmer climates. Several of the Kernels' games have been played with temperatures in the 30s and 40s, so they were glad to see things warm up a bit over the past weekend. "Anything above 50 right now is good for us," Haar said with a smile Saturday. "If it’s not 35 and raining, we’re happy." You won't find Haar's name on many of the organizational "top prospect" lists published during the offseason, but the 24-year-old from San Diego is showing power that's been largely missing to this point in his professional career. Haar was selected by the Twins in the 34th round of the 2012 MLB June Amateur Draft, following his senior year at the University of San Diego. He hit only one home run in 44 games with the Gulf Coast League Twins in 2012 and went deep just six times in 60 games with the Twins' short-season Appalachian League affiliate in Elizabethton last season. Haar said it took some time for him to adjust from college pitchers, who generally threw a mix of pitches, to lower levels of professional ball, where he faced a lot of strong young arms who were looking to impress. "In GCL that first summer, it was just fastballs all day," recalled Haar. "I actually struggled a little bit because I forgot how to hit a fastball. It was new to me. They were blowing it by me." He had to continue working on being able to catch up with the heat a year ago in Elizabethton. "In E’town, it was rookie ball, so there were a lot of 18-year-old pitchers out of high school that maybe thought they threw 95 and really threw 91-92, trying to throw fastballs by me. I got more fastballs then. Jeff Reed (hitting coach at Elizabethton) is a great hitting coach, so he helped me out a lot," he said. That doesn't necessarily mean the pitching he faced in college was superior to what he saw his first two years in the pros, though. "I’d say not better, but more command of their sliders," Haar explained. "In E’town it was sliders in the dirt, sliders in the dirt. They never flipped one over for a strike. In college, it was slider for a strike, slider for a strike, now you’re down 0-2. But now (in the MWL), it’s more college guys so I’ve got to readjust to college pitching, I guess." Haar knows he's largely been feasting on fastballs this season and said he already sees pitchers making adjustments. "The first game of a series, usually I get some fastballs to hit. If I hit them well, then the next two or three games I get sliders and changeups and curveballs," he said. "Just making that adjustment has been a little harder than I would have thought, but I’ve got to hit the fastball when I get it." Kernels hitting coach Tommy Watkins has been working with Haar to keep a step ahead of the adjustments the pitchers are making. "They’re throwing me off-speed a lot, so I’ve got to start adjusting my swing a little bit towards that," Haar said. "Tommy and I have been working on that the past couple of days. Not really trying to strike out less, but just put more balls in play hard. "I’ve hit two home runs off sliders, but I think they were the only hits I’ve had off sliders. We were working on that (Saturday), just kind of letting the ball get a little deeper, seeing it deeper." At 24, Haar is a bit older than the average MWL position player, but he's not feeling any extra anxiety about trying to advance quicker up the Twins organizational ladder because of that. "I don’t really worry about that. I’m just having a good time in Low-A with my friends," he said. "I got drafted in 2012 and pretty much all the guys here were drafted in the 2012 draft, so it’s nice to move up with them, in a sense. I’m just letting my play speak for itself and doing what I can here." That includes being versatile in the field. 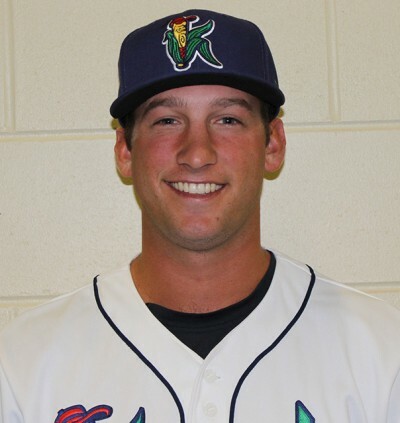 Haar has played both corner infield positions for the Kernels already and that's fine with him. Haar said he'd play anywhere, "as long as I'm in the lineup." Haar played some football and basketball in high school and said his interests include, "pretty much every sport with a ball." But as a Southern Californian, his interests outside of baseball go beyond what local fans might consider the norm. "I’m from San Diego, so I surf whenever I can. Usually in September I take some time off from baseball and I go surf. But when I get back in to workouts, I don’t have much time for that." There's obviously neither time nor opportunity for surfing during the season, so Haar is looking for other things to do with his limited down time. "I do enjoy fishing, so since we’re in Iowa, I’d like to get out and fish a little bit, but it’s tough," he said. "Getting back from a long road trip, you want to sleep in, and then you’re at the field." Of course, there's always the standard fallback option for ballplayers: video games. Haar and teammates Garver and Zach Larson, who live in close proximity to one another this season, "have a little FIFA battle on the X-Box. We’re on that quite a bit."